Take a once-in-a-lifetime journey through the iconic resorts of North Italy, including a retreat in the heart of Tuscany, a visit to Pisa’s Leaning Tower, stops in Milan, Florence and Venice, and 3 nights in the tranquil sanctuary that is Lake Garda. This multi-stop tour allows you to explore chic cities but also gives you the opportunity to discover true Italian culture, as well as relaxing natural landscapes featuring rolling hills, lush vineyards and mountain backdrops. With exclusive pre-arranged tours and day trips, accommodation and private transfers, this is the perfect tour on which to discover the heart of North Italy, while enjoying iconic cities, secret canals and countryside hideaways. Price: Starts from $3515 per person (land rate). Packages can be booked with just a 20% deposit. Please refer to the Pricing box at the bottom of the page for more information on pricing and deposits. Flights: Please note that this package does not include flights. When purchasing your flights from your chosen airline, we recommend that you fly into Pisa International Airport and fly out of Verona Villafranca Airport. If this is not possible for you but you would still like to book this package, please contact us for a customized quote or click “Request Quote” in the box at the top of the page. Itinerary: Take a once-in-a-lifetime journey through the iconic resorts of North Italy, including a retreat in the heart of Tuscany, a visit to Pisa’s Leaning Tower, stops in Milan, Florence and Venice, and 3 nights in the tranquil sanctuary that is Lake Garda. This multi-stop tour allows you to explore chic cities but also gives you the opportunity to discover true Italian culture, as well as relaxing natural landscapes featuring rolling hills, lush vineyards and mountain backdrops. 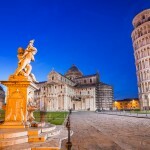 As a part of this Italy packaged tour, you can also enjoy pre-arranged excursions and activities in the major cities, including a guided tour of Lucca in Tuscany, a day trip to Pisa, a walking tour of Florence that includes the Uffizi, a guided Milan tour, a private tour of Venice’s main attractions and a guided day tour of the pretty villages that line the banks of Lake Garda. Day 1: Welcome to Tuscany! Experience luxury from the moment you step foot in the Tuscan countryside with a private transfer from Pisa airport to your hotel in the ancient city of Lucca, which lies in the heart of Tuscany. Here you can relax surrounded by mountain scenery and rolling fields of green, or stroll in the sunshine on the ancient city walls that encapsulate the city’s Old Town. After enjoying a buffet breakfast at your hotel, with decadent pastries and hot Italian coffee, it is time to discover the delights of the magical city of Lucca. Our expert tour guide will greet you at your hotel and take you to all the main attractions, including the Roman amphitheater, Napoleon Square and the famous Guinigi Tower, which has an iconic roof garden with trees and Mediterranean shrubs where you can take in glorious panoramic views of the city below. You will also learn about the fascinating city walls that wrap the city’s Old Town in 3 miles of history! After enjoying your morning of sightseeing you will have time to discover the designer shops on Via Fillungo or stop for an Aperol Spritz and snacks at one of the cafes that circulate the walls of the vibrant amphitheater. 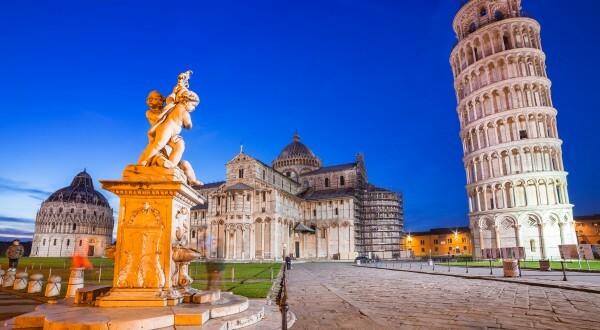 Enjoy a half-day guided tour to the famous city of Pisa, where you can visit the iconic Leaning Tower and Piazza dei Miracoli. On this tour your expert guide will explain to you the secrets and failures behind the tower’s construction and you will also have the opportunity to visit inside the tower, where you can climb the ancient steps up to the Bell Tower, where you can take panoramic photos of the cityscape. After enjoying a continental buffet breakfast at your hotel you can bid your final fair well to the pretty city of Lucca on a short walk to the train station, where you can recline on a first-class train to Florence. Our polite driver will be waiting at Florence station to greet you and will take you to your hotel in the heart of the city, where you can settle in. The rest of the late afternoon is yours to explore historic Florence, known for its Renaissance art, intricate architecture and vibrant Italian culture. 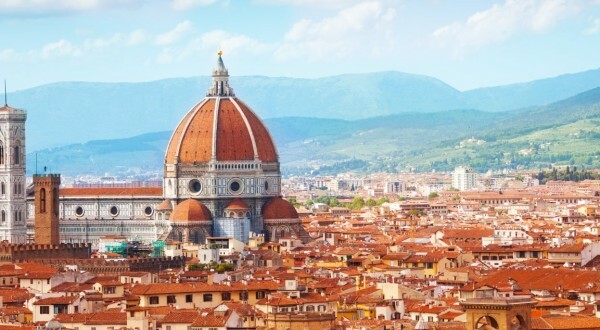 Spend the morning with our professional guide, who will take you on a guided tour of Florence, stopping at iconic attractions, such as Repubblica Square, the exterior of the Cathedral with Brunelleschi’s Dome and Palazzo Vecchio, and admiring the Renaissance architecture and vibrant art scene. As a special treat, you will also enjoy an in-depth tour of the Uffizi Gallery, which is one of the world’s most important art museums where you can admire priceless masterpieces from great artists. Today you will travel on a first-class train from Florence to the chic city of Milan, where our professional driver will be waiting at the station to whisk you to your vibrant hotel in the heart of Milan. The afternoon will be yours to discover the designer shops, boutiques, fashionable cafes and glorious architecture. 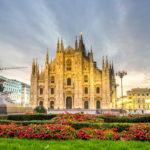 Enjoy an iconic tour of Milan’s sights, including the staggering Cathedral, which is a superbly rich tribute to Gothic architecture that took several hundred years to construct. The highlight of this special tour is a stop at Santa Maria delle Grazie, where you will be treated to a rare opportunity to see Leonardo da Vinci’s “The Last Supper“, which is a highly protected masterpiece that can only be seen by special appointment. 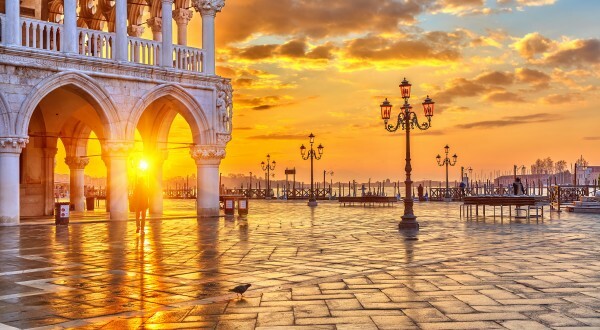 It is time to say goodbye to the chic city atmosphere of Milan and enjoy a first-class train journey to one of Italy’s most loved cities: magical Venice. You will experience luxury from the moment you arrive in this romantic city with a private water taxi from the station to your boutique hotel. Here you can relax and unwind before getting lost and finding your true self in Venice! Today you can immerse yourself in the beauty of Venice and discover the secrets of its rare architecture and unique canals with our professional multi-lingual guide, who will take you to the famous and most-loved attractions, including St Mark’s Square, Doge’s Palace, San Marco Basilica, the bell tower known as Campanile di San Marco and the clock tower with its high archway leading to Mercerie, which is the main shopping area. 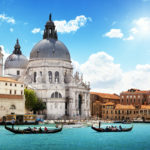 With its focus on Venice’s magical buildings and canals, this special tour surely gives you the unique opportunity to relive the days of supreme authority from yesteryear and, as a wonderful treat, you will also enjoy a visit to the famous Bridge of Sighs. What a delightful way to end your sightseeing tour of Venice! Bid “arrivederci” to Venice and enjoy a luxury first-class train journey to the Italian Lake District, where you can discover the secrets of Italy’s largest lake: the grand and mysterious Lake Garda. A private transfer from Garda train station to your hotel in Desenzano del Garda is included as standard and you will arrive with plenty of time to discover the vibrancy of Desenzano’s town, where there are plenty of bars, cafes, restaurants and shops, as well as a pretty harbor where you can sit and admire the lake views. One of the best ways to explore the mysterious delights of Lake Garda is on a tour of the quaint villages that decorate the banks with their pastel-colored villas and vibrant flowers that line lake-side walking trails. This tour gives you time to fully appreciate the pretty landscape around the lake, including snow-capped mountains adorned with dark green woodland, and also includes a boat ride across the glistening waters. Today sees you leaving this remarkable country but you can still enjoy one last deep breath of fresh Mediterranean air as you enjoy a private transfer from Desenzano del Garda to Verona airport for your flight home. How to book: You can book this package safely and securely online using the box at the top of the page. Simply select the number of travelers, the star of accommodation you would like and your chosen vacation dates, and click “Book now”. You can also select to pay the full balance or just a deposit. Alternatively, if you would like to find out more about this special vacation, please call our friendly team members at (347)-594-5500 or click here to send us an inquiry. 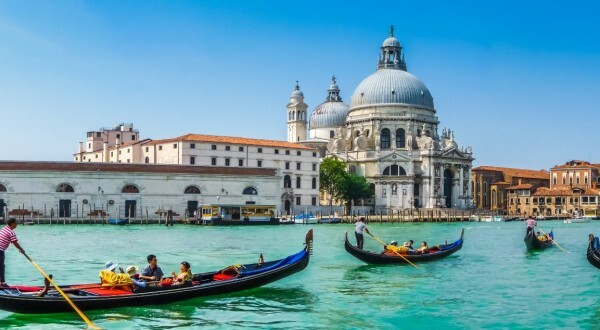 Please note that the San Marco Basilica in Venice is closed on Sundays and religious holidays, and the art galleries in Florence and Santa Maria delle Grazie in Milan are closed on Mondays. In the case of unavailability, alternate itinerary options will be offered.